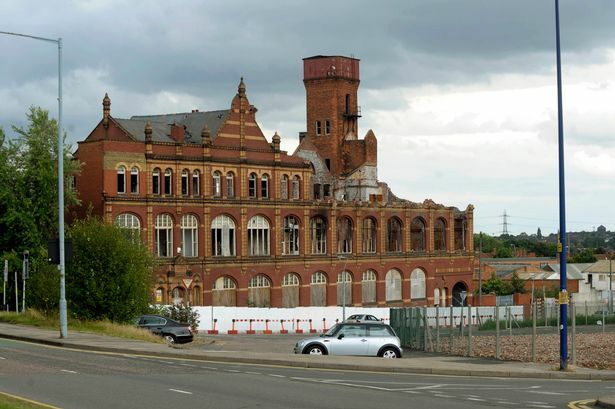 The regeneration of a historic former cycle factory gutted by a fire nine years ago is set for the go ahead next week. The former Belmont Works building, in Cardigan Street, has been derelict and unused for many years but is poised for a new future as part of the Eastside Locks development. Developer Goodman is carrying out a wholesale regeneration of the land next to Birmingham City University&apos;s campus which includes new offices and more than 600 student bedrooms. The restoration of the Belmont Works factory will provide a new commercial focal point for the project if backed by planning chiefs when they meet next Thursday. Described as an "exemplar of industrial architecture" in planning documents lodged with the city council last year, Belmont Works was built in 1899 as the headquarters of the Eccles rubber and cycle company. Now locally listed, it has been used for a variety of purposes over the years including the manufacture of linen clothing, bedsteads and pianos and as offices for the Co-operative Society from the 1960s. It was severely damaged by a fire in 2007 and the roof and south-eastern end of the façade have subsequently collapsed, leaving the building in a state of dereliction. Internally, little of the original fabric now remains. Birmingham City Council&apos;s planning committee will debate the proposals to carry out demolition and new-build work to create a 21,250 sq ft hub aimed at small- and medium-sized companies and graduate enterprises associated with BCU and the wider design sector in Birmingham. Two gable walls and the water tower will be knocked down, although the latter will be replaced, while the remaining dilapidated structure will be renovated and extended. The building could also house retailers and will accommodate the marketing and management teams running the Eastside Locks development which includes new office buildings 6 and 8 Cardigan Street, a hotel, leisure space, student halls of residence and public realm. City council officers have recommended the Belmont Works redevelopment is approved. They said in a report: "Given the state of dereliction, it is considered the proposals to restore the building, in particular the water tower which forms an important feature visible in surrounding views, and bring this important local building back into active use, would enhance the conservation area. "The development would also provide a link to the industrial past. The building lacks a viable use at present and is now in a ruinous state and at risk of further dereliction. "The proposals (will) regenerate a strategically important site in accordance with the Curzon Masterplan which will hopefully provide the catalyst for further redevelopment of the Eastside Locks area."